Bahai Faith Calendars have feast and holy days marked. The unique and versatile design of this fold-over business card calendar has made it an instant favorite. Printed in full color on both sides, this 3.5x4" card is scored and has a gloss UV coating to make it durable. It runs from January 2019 through March of 2020. On Sale! (They were $3.95, 5/$17.50 & 50/$160) The 2019 calendar celebrates the 25th anniversary of the publication of our pocket edition of The Hidden Words by reproducing a larger section of the artwork that the cover was drawn from. It also includes the beginning of the first Hidden Word. We are now out of Date Books and will not be reordering more this year. 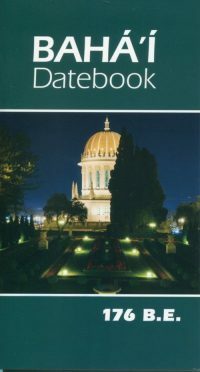 The latest edition of the popular 32-page booklet-style Bahai date book calendar is full of useful information to keep you up-to-date on Holy Days, Feasts, and other special events.